Our worlds are so full of wonders and surprises. Everyday incredible and amazing facts and places are discovered about our world; our Earth. There are number of places on our planet that are yet to be discovered, while some have been discovered. The diversity in the geographical locations and intense to normal climatic conditions offer the widest range of natural wonders, be it with the human interference or the natural sights. The below mentioned unbelievable and amazing places will make our eyes pop and jaws drop. Here are 10 landmarks which look more of like a scene from a science fiction movie. 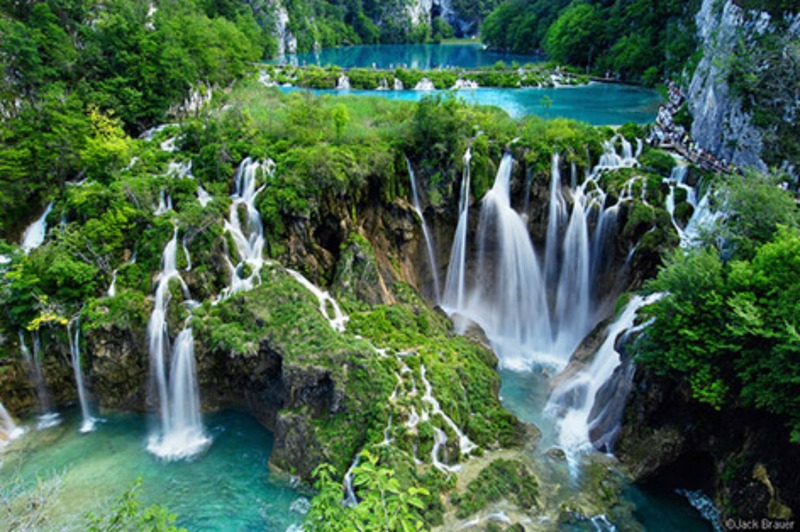 The oldest national park in Southeast Europe, Plitvice Lakes National Park, was founded in 1949. The lakes were formed as a result of natural activities over thousands of years. Like all other natural sites, Plitvice National Park was added to UNESCO World Heritage. The park is world famous due to the lakes that are arranged in cascade style. There are 16 interconnected lakes that are in the form of small waterfalls collectively stretching to two square kilometers. Depending on the quantity of minerals, the lakes also change color from Azure to Green, Grey or Blue. The park is a home to almost 100 bird species and almost one million visitors flock the mesmerizing park. The entire park turns snowy white during the winter when the water freezes. The Eye of Sahara, also known as Gueid er Richat and Richat Structure, is a circular geological structure in the Sahara desert in Mauritania. The diameter of the structure is almost 48 kilometer. Initially it was thought to be the result on an asteroid impact because of its high degree of circularity and then, the result of volcanic eruption but nothing could be proved. The fact is, the mystery still continues about the equidistant rings to the centre of the structure. 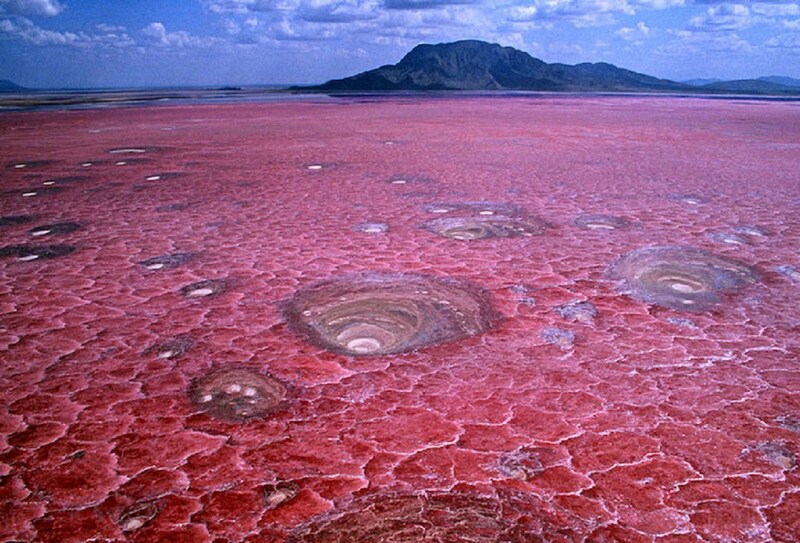 Located in northern Tanzania, Lake Natron is a salt water lake. The lake has uniquely high salt content and only salt loving organisms flourish in the lake. The organisms produce red pigment that colorizes the lake water into red color. The lake is shallow to only 3 meters deep. The lake is said to be deadly for other species as it calcifies their body after dipping into lake. Officially known as Playa Del Amor, Hidden Beach is a water structure at Marieta Islands in Mexico, which is a result of human activities. 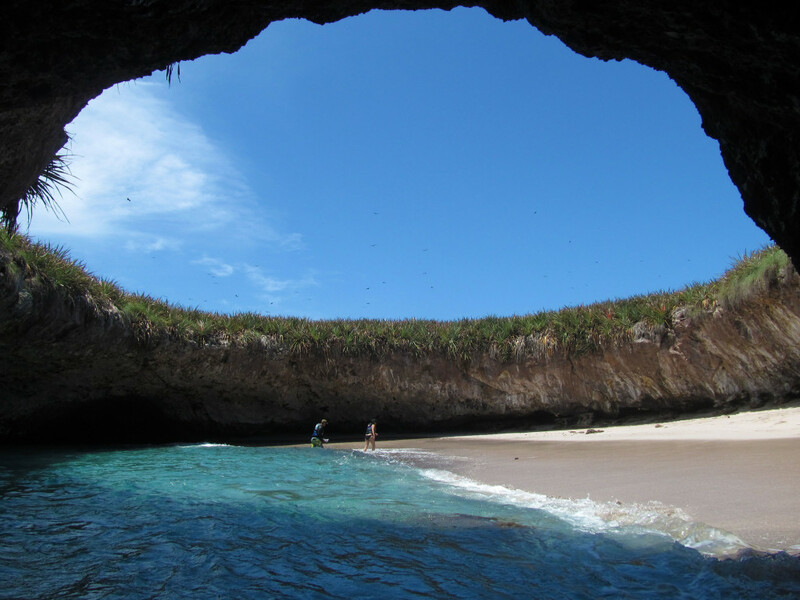 The Hidden beach is said to be the result of extensive bombing test by the Mexican Government during 1900s. The Marieta Beach has always been uninhabited, which made it is an ideal place for military testing. The test bombs have reportedly created a numerous caves and rock formations on the Islands. The Hidden beach is invisible from outside, one have to swim through a 50 foot long water tunnel to access the beach. Cenote Angelita which literally means “Little Angel” is an underwater river in Mexico. It was formed due to the rock collapse over a period of time which resulted in the sinkhole that began to trap both fresh water and saline water deep within its crevice. From the top it seems like any other water body, but after 29 meters depth, there is 1-meter layer of hydrogen sulfide, after which it is filled with is saline water from 30 to 60 meter deep. In reality there are no underwater rivers, it is just an illusion caused by the hydrogen sulfate layer, due to which fresh water and salt water meet causing an incline in the salinity level of water. Fingal’s Cave is similar to the Great Giant’s Causeway in Ireland. Both are made of same neat hexagonally jointed basalt columns. Legends have connected both the structures as a part of same bridge as a result of same lava flow due to volcanic eruptions that might have occurred some 60 million years ago. The Fingal’s Cave has been named after the hero of 18th century poem and is located in a sea Island known as Staffa in Scotland. The cave is 72 feet tall and 270 feet deep inside the water. However, it is not possible to enter the cave with a boat but some travel agencies provide tour to near about places to Fingal’s Cave. The Aogashima is Japanese Volcanic Island situated in the Philippine Sea. The entire island is an active volcanic carter. The island is inhabited by approximately 200 people and stretches from 3.5 kilometer in length and 2.5 kilometer width. The island is administered by the capital of Japan, i.e. Tokyo. What makes this island so interesting and amazing is that there is a small volcano within a large volcano named as Maruyama. The volcano last erupted in the 1785, killing more than one third of island’s population. 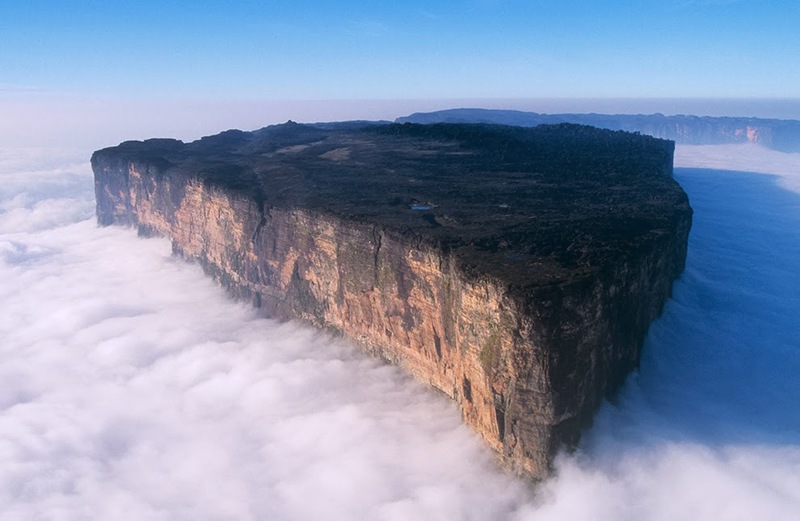 Dating back to 2 billion years ago, Mount Roraima is a tabletop mountain and one of the oldest mountains in the earth. The Mountain borders three countries of Brazil, Venezuela and Guyana and is one of the world’s most amazing geological formations. The sheer vertical cliffs of mountain are 400 meters tall on all sides. The mountain has several waterfalls which are one of the highest waterfalls in the world and thus makes it almost impossible to climb until unless one is an experienced rock climber. The Hidden Underwater Waterfall is one of the rarest optical illusions within the Indian Ocean in the Mauritius Island. The cause of the phenomenon is sand and silt moving down to one of the cliffs. Strong ocean currents carry with them huge amount of sand from the shores of Mauritius that falls in the abyss below, which creates an illusionary effect of one-of-a-kind Underwater Waterfall. Also known as Fly Ranch Geyser, Fly Geyser is a result of man-made well drift during 1964. The geyser was created accidentally when a well drift was created and was left uncapped or may not have been capped properly. Slowly the dissolved minerals started rising along with the algae, resulting in the alien like structure which we see today. The mineral water from the geyser is released constantly reaching as high as 5 feet in the air. hey great, so you have already one of these places, so hows the experience? It is amazing to see some of the incredible places this world has to offer us. I think my favorite is the hidden waterfalls in Mauritis..
All of these places are wonderful but I like the hidden beach in Mexico. I think, more beautiful places must be discovered by humans in the future. Wow. These are indeed unbelievable. I hope I can go to at least one of those places. Where is the best to visit first, you think? we have a truly wonderful and amazing place! Enchanting! These are truly Nature’s wonders. That Eye of Sahara is something very new to me. Your photos are simply awesome! I’ve not heard of any of these places and they are indeed amazing! I hope I would be able to see them for myself one day though some of them look scary! HI! You must be mistaken. I’m not using your logo, What do you see? My bucket list includes visiting all the UNESCO Heritage sites in this lifetime. We live in a world that has so much beauty and magical places that it saddens me when some humans choose war over exploring the world and connecting with others. Gosh… It’s unbelievable and albeit the amazing photos… it’s actually quite scary to imagine myself visiting this places myself… Especially the Hidden Underwater Waterfall! Hi, I am Vanessa Ally. These are amazing photos and I wonder how I’ve never heard about some of these magical places before. Definitely worth visiting. Nature has awesome creations! Cenote Angelita Underwater – River, Mexico is the unique place to visit for those who likes diving. Wow! Amazing places, that’s what I called the Art of God. He is just amazing! you are RIGHT, man !!! Wow! Those are really great places. How I wish I could visit at least one of them. Then again, maybe I should start with going to the best places here in my country first. thanks Kyril for appreciate our work !!! Amazing places and such wonderful pictures! Our world has so many wonders!